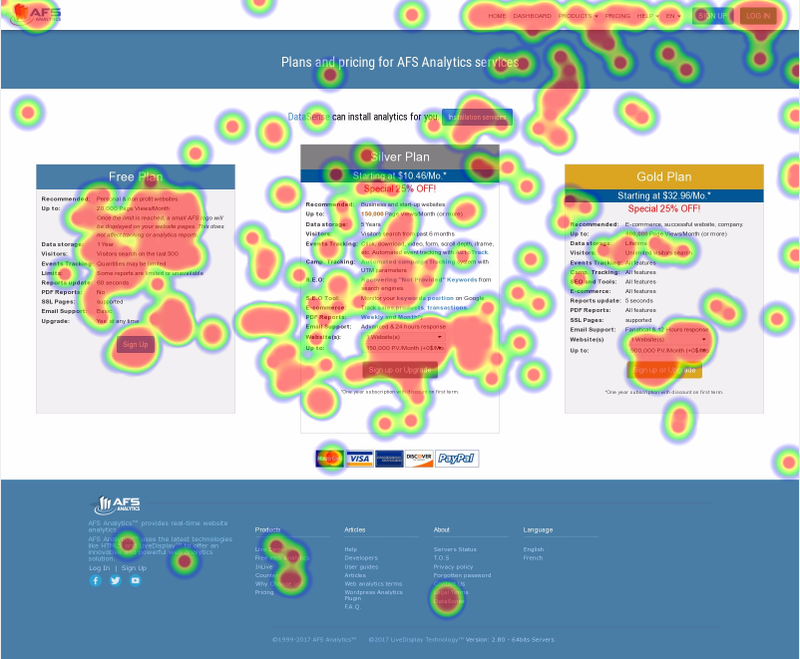 With LiveDisplay technology, AFS Analytics offers a real-time web analytics reporting tool. Your website data is tracked immediately and the reports continuously updated. 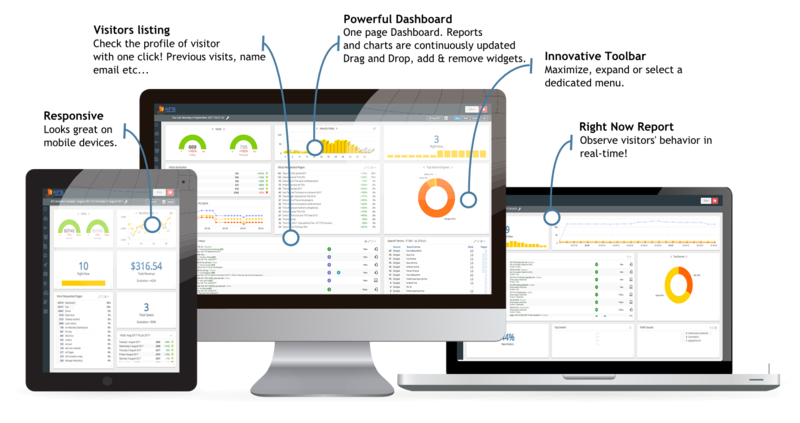 AFS Analytics provides everything you need, including a rich user interface and powerful tracking system. 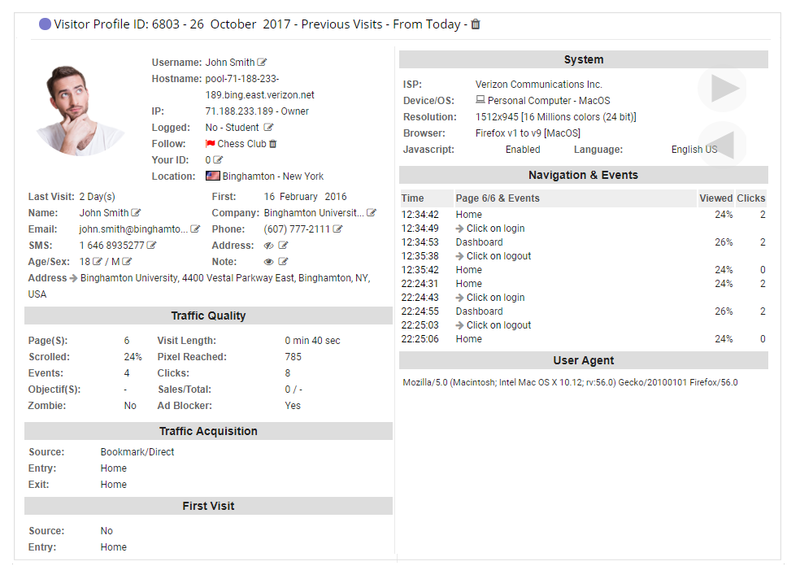 AFS Analytics tracks all visitor interactions: clicks, videos, downloads, windows, time spent to fill forms, navigation, etc. Analysis of quantitative and qualitative data. Tracking by "dataset" or automatically with the "AutoTrack" option. Alert event reports hidden bugs. AFS analyzes and measures the performance and success of your ecommerce website. The dashboard shows real-time sales as well as details of the products sold. You can monitor the conversion rate of your marketing campaigns and access to the buyer's profile and advanced useful metrics. Monitor Google rankings to measure your SEO success. With our SEO tool, check and monitor your organic keywords ranking in Google. 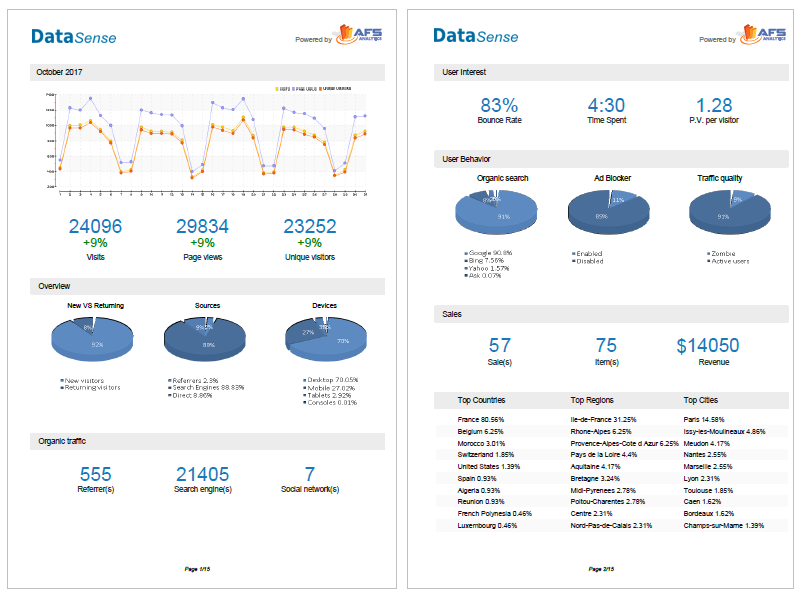 Customized with your Logo , get and receive automated analytics PDF Reports. Your PDF reports can be easily scheduled for delivery to your inbox daily, weekly, and monthly. Undeniable Benefits of Using AFS Analytics for your digital marketing strategyl. Analysis traffic quality. Measures the effectiveness of advertising campaigns. WordPress plugin for a quick installation. 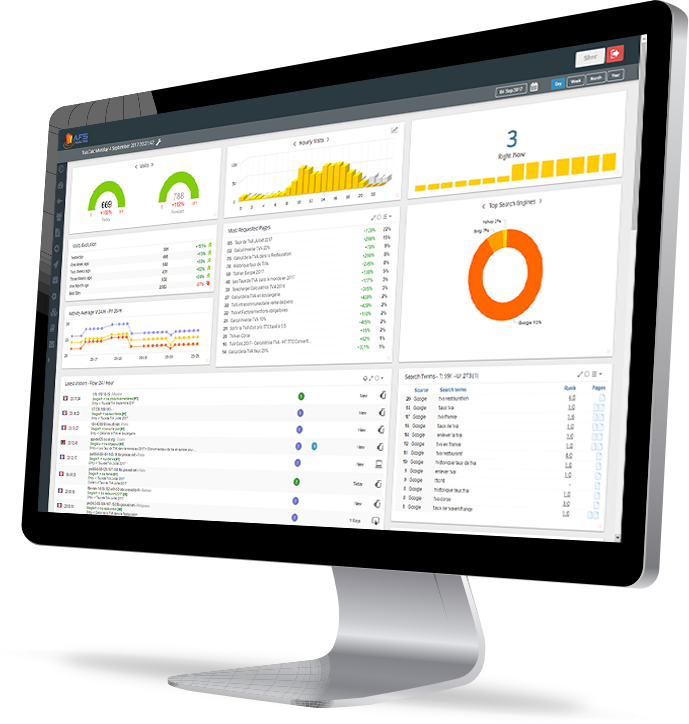 With our innovative real-time dashboard, all website metrics are displayed on a single page. The toolbar is intuitive and offers user-friendly features such as zoom, scroll, menu, etc. You can customize your dashboard by changing the boxes locations. For each visitor, a unique identifier is created giving you access to their dedicated profile. With the data exchanged with your website, the profile will display name, address, phone, e-mail, etc. Recovering "Not Provided" Keywords and rank checker tool. "Not Provided" keywords from search engines is a thing of the past! 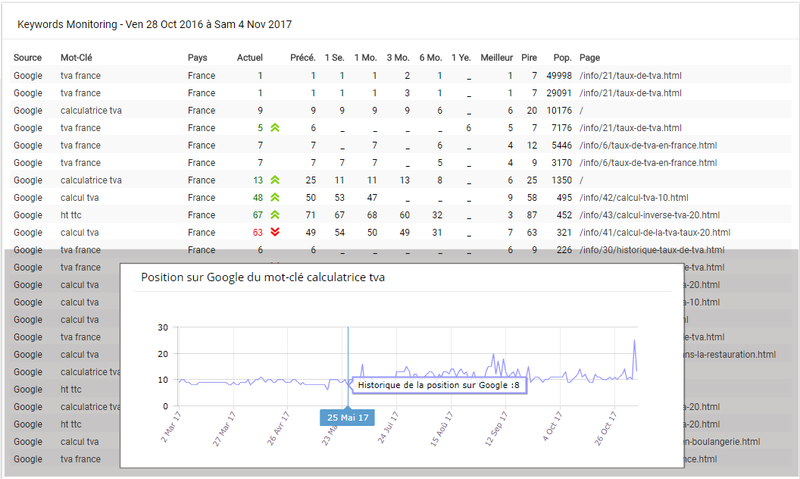 Thanks to artificial intelligence, AFS Analytics "recovers" the keywords used by visitors. Check your keywords position in Google with our powerful SEO tool. 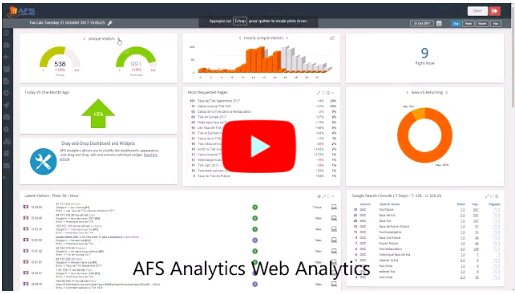 AFS Analytics has been built to deliver ultimate performance. The latest technologies were used including HTML5, JQuery , AJAX and cloud system. AFS Web Analytics is hosted on powerful servers such as IBM and DELL designed for high reliability as well as performance.